Have all ingredients at room temperature. Position oven rack in lower third of oven and preheat to 325 degrees F (160 C). 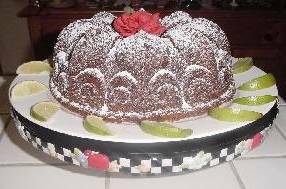 Grease and flour a 9 or 10-inch bundt pan or Fleur-de-Lis* cake pan. With an electric mixer, fitted with a flat beater, beat butter and cream cheese at medium speed until creamy and smooth, about 30-40 seconds. Add 3 cups of the sugar and beat until light and fluffy, about 5 minutes, stop mixer and scrape bowl occasionally. Add eggs, 1 at a time, beating well after each addition. Beat in vanilla and 3 tbsp. key lime juice (or regular fresh lime juice, if you can't find the key lime juice). Reduce speed to low. Fold in flour, baking soda, and salt mixture in 3 additions, blending each addition just until smooth, stop mixer and scrape bowl occasionally. Fold in lime zest. In a small bowl, whisk 1/4 cup key lime juice and 3/4 cup sugar until blended. Set rack over a sheet of waxed paper, Generously brush cooled cake with glaze. After glaze has set; approximately 10 minutes, lightly sprinkle cake with confectioners' sugar. Nordic Ware's Fleur-de-Lis cake pan can be purchased at Nordic Ware's website at: http://www.nordicware.com. PLUGRA BUTTER is an unsalted European style butter, and is great for baking. Any good quality unsalted butter can be used. KEY LIME JUICE can be purchased at most large supermarkets. It usually can be found on the juice aisle where the concentrated lemon and lime juices are kept. I love cream cheese pound cakes and this recipe is one of the best I have ever eaten and it is so easy to make as well. This is our favorite pound cake....it is wonderful with fresh strawberries and fresh whipped cream! I bake this pound cake in 2 (6 cup) Nordic Ware Bunt pans and give them as Christmas gifts. Great cake. I am a man and love to bake. Could not be better. My husband has been dieting for two years but this is the only dessert that he will eat. Excellent!! My uncle loves this cake. Absolutely fabulous. I made it for an office birthday cake. the cake was finished before the day was out and there are only 10 people in the office. My first time making this cake. Cake is delicious and easy to make. A winner with my family. I'm making my second cake in two weeks. Wanted to make a Margarita Cake but was afraid any variations would mess up the wondefulness. If anyone knows how to make this recipe into a Margarita cake, please tell here. Very gourmet. Mine easily cooked in one hour using a Nordic Cathedral Pan, so yummy! I made this cake for Thanksgiving and my family loved it. Tastes best if you make it a day ahead of time with the key lime juice and confectioners' sugar glaze soaked into the cake. Libby's Key Lime Cream Cheese Pound Cake was the best ever!! I have made it about 6 times over the past 2 years. It is the best when served warm. It's always the first to go at dessert parties. This one's a keeper! The cream cheese makes all the difference from your typical Key Lime pound Cakes. The crunchy glaze is everyone's favorite. A frequently requested cake from my kitchen! This is a great cake recipe, which I have tried two ways: First, I followed the recipe exactly as presented. The second time, I added one package of instant vanilla pudding. The pudding REALLY made a difference. This cake was the centerpiece dessert at a recent party and was a great hit. It totally holds its form, so you can cut very thin slices and they won't go crumby on you. Everyone loved the citrus elements, especially as they weren't expecting them to be there. This is much superior to regular pound cake. This cake is absolutely Divine!!!! My son says that eating this cake hazardous to your health because it's soooo addictive ??. . Once you start eating, you can't stop!! !